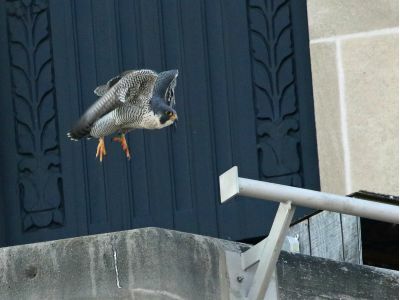 I paid a visit to Peregrine Central on Friday to clean up around the nest box and get all the feathers and other accumulated debris out of the drain. Rebecca and Kewpee had a romantic moment just before I arrived, which was adeptly captured on camera by the ever-alert and talented Andrea. The falcons either ignored me or, most likely, didn’t realize I was out in the window well until I opened the back door to the nest box to clean the camera lens. That got their attention and Rebecca landed in front of the box and was surprised, I think, to see my head and arm in the box. She flew off and circled around, landing back on the parapet. After a few initial squawks, she calmed down and just watched me finish up. Kewpee, of course, was in hyper-drive, flying back and forth making sure we all knew he was on top of things. Rebecca did call to him quietly, that everything was fine, but he was pretty wound up, as usual. Eventually he flew up a floor and watched from there. It looks like the box and the birds are all ready for nesting season. Check out the photos in the gallery of the birds’ reaction to the housekeeping visit. Last year the first egg was laid on March 16, so it’s time to start the nest watch. Stay tuned.